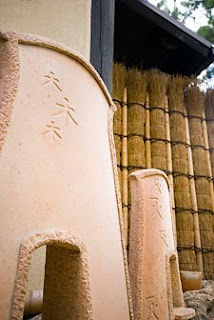 The gardens at the Tozan Tea House were designed with tea in mind or, more accurately, the experience of drinking tea. 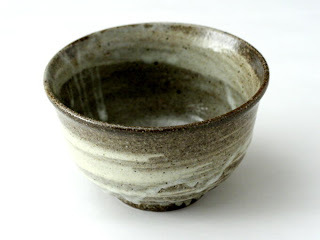 For the Japanese, the experience of drinking tea is not just consuming a pleasant beverage, as in having a “cuppa”, but an experience of rootedness and connectedness within oneself, a getting one’s bearings, a regaining of one’s temper after having lost it. Coffee is for energy, tea for composure. Since the tea is served in a bowl, rather than a cup, drinking tea is a two-handed experience. Unlike the cup which is kept at a distance and raised to the lips as though it were a foreign object akin to a knife or fork, drinking tea from a bowl requires that people draw the bowl to themselves, warming their hands, encompassed in the experience. Now, to an American eye the garden at the Tozan Tea House is not yet developed, but to a Japanese eye the garden is already there in the way the land lies, the grasses, the bushes, and the trees, and, oh yes, the rocks and the critters. Rather than impose a foreign, geometrical grid on the land, a Japanese design draws its form from the lay the land. Much as a wise parent rears a child, drawing out rather than an imposing upon, the gardener cultivates the land’s gifts. The design’s purpose is lucidity. Form and economy are the means used to accomplish the lucidity. The lines of the design reflect the contours of the land, not merely replicating them, but enhancing them, using the old principle of compare and contrast, rather than duplication and contradiction. Since Japan is a group of small, heavily populated islands, land is used economically, drawing from it, rather than replacing it. Unlike the Western experience in which land is thought inexhaustible, as in a housing subdivision in which the land is cleared and regimentally planted, the Japanese conserve the land knowing it is finite. The tea house’s garden is indigenous, the tea house and its garden reflecting the land’s contours, flora, and fauna. Instead of being a beautiful picture painted by the designer for people to look at, the tea house garden is an experience. William Temple, the late, great Archbishop of Canterbury, in his commentary of the Gospel of John wrote of lucidity, “To see life steadily and to see it whole.” Seeing life steadily and seeing it whole is the heart of the experience of tea at the tea house and its garden. The garden is brain-child of Dr. Don Bendel, professor emeritus of ceramics at NAU and his alter ego, the late Yukio Yamamoto, master potter of the Tozan Kilns in Japan. 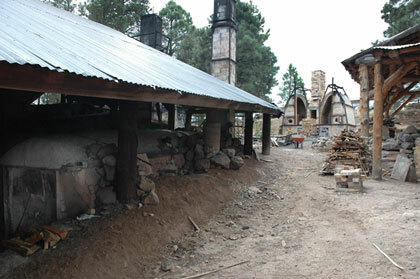 Located at the bottom of a hill just off Lonetree Road on the NAU campus, the first step into the Tozan Tea House’s garden is a few paces from the giant, wood-fired kilns where the tea bowls are fired. The garden encloses a rising path past the ceramic studio where the bowls are thrown. The path then crosses over an earthen and wooden bridge and on up to the Tozan Tea House where the tea is not merely consumed, but also experienced. Since the Tozan Tea House is set on a rise, it offers vantage from which people can see not only the trees, but also through them, and beyond them to the forest. The lintel of one of the doors into the Tozan Tea House is low which by tradition was for the use of the samurai warriors. They could not get through the door with their swords, forcing them to leave their swords outside. Similarly, a Navajo was once asked why the entrances into a hogan were so low. The Navajo replied, “So that when people enter our homes, they must kneel.” Such is the tea house. No body armor. No pretenses. The quiet experience at the garden at Tozan Tea House is necessary for lucidity. Frenzy does not make for clarity. Since the garden is at peace with the land, people can be at peace with themselves and gain that lucidity to see life steadily and to see it whole.